In 2011, MTO’s Tenants Rights Hotline received 709 calls from renters in the City of Chicago caught up in the foreclosure of their buildings. Renters are the hidden victims of the foreclosure crisis. According to a recent report by the Lawyers Committee for Better Housing over 50,000 renters have experienced problems such as: deteriorating building conditions, absentee landlords, unexpected eviction notices or any number of other potential outcomes of getting caught up in rental buildings being impacted by foreclosure from 2009-2011. This staggering figure accounts for 9% of the city’s housing stock. Tenants living in buildings going through foreclosure face a variety of issues. Tenants call the hotline because landlords have gone missing and are no longer fixing things or paying the utilities or because the tenants are getting evicted by the bank. 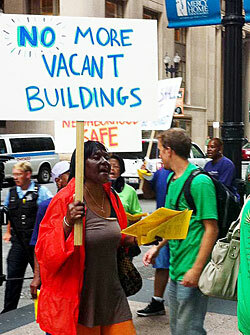 As part of the response to the foreclosure crisis, MTO has joined Keep Chicago Renting Coalition (KCR). The Keep Chicago Renting Ordinance (KCRO) would require banks in the case of foreclosure to keep renting to tenants in good standing under the same terms and conditions. In July, MTO tenant leaders attended a press conference and rally in support of the ordinance’s introduction to City Council. 43 Aldermen signed on as supporters of the Ordinance. We would like to thank all coalition partners and the 43 Alderman who signed on for their support. MTO ask that you continue to support the KCR Coalition as we continue to work to get the ordinance passed! Check out the coverage below and to get involved please contact Robert Clack at 773.292.4980 ext. 242 or at robert@tenants-rights.org. The Keep Chicago Renting Coalition member organizations are: Action Now, Albany Park Neighborhood Council, Business and Professional People for Public Interest, Brighton Park Neighborhood Council, Chicago Coalition for the Homeless, Kenwood Oakland Community Organization, Lawyers’ Committee for Better Housing, Logan Square Neighborhood Association, Metropolitan Tenants’ Organization, Northwest Side Housing Center, and Organization of the North East.